Narcissists lack empathy and their only way to behave in intimate relationships is through lies, manipulations, neglect, gaslighting… you name it. They only think about fulfilling their own selfish needs. They don’t care about anyone else. And it is not that they can’t feel any emotions. They can, but they are shallow and short-lived. In fact, I think it is safe to say that they don’t even love themselves even though it may seem like it. The only thing they want more than anything is attention. They will do everything they can to always be in power and in control. They manipulate you, they destroy your self-confidence, they make you powerless only to rule you. Narcissistic relationships can be addictive like drugs because the abuse lasts very long that your mind and body get accustomed to the pain that it is almost impossible for the victim to break free. If you too were a victim of a narcissist – don’t be so hard on yourself. You did what you could, but it was a force that was stronger than you. I know you wanted to leave them. I know you didn’t do anything wrong. It’s just that they are so good manipulators that they made you think it was all your fault and they crushed your self-esteem. And probably, they used some of the following 5 common techniques to keep you under their control. When you start seeing things clearly and you confront the narcissist about something they did, they immediately play the victim and changes the subject to something that you supposedly did 5 months ago that had hurt them deeply. He uses this technique to not only get themselves out of the situation but to make you feel guilty about confronting them also. No matter what you do – they’ll always find some fault into it. This is a tactic they use to destroy your confidence and for you not to think that you are doing all the right things and they do the wrong things. This gives them power over you as you will be constantly seeking their validation for everything you do. This is a manipulative technique that they use to divert you from all the positive things that you are doing for them. They want you to feel as though you are not enough for them and you can’t meet their needs – but they stillwant to be with you. This is a common defense mechanism of all narcissists. They will put the blame on you and they will project all their negative feelings towards you to make you feel guilty when it is them who should feel guilty. This happens because a narcissist can never admit they are wrong. They are doing this to protect their image of “being perfect and flawless human beings.” They don’t care about feelings, they just care about their ego. They will be hurtful from time to time, using mean and sarcastic jokes to hurt you. If you do get hurt and angry, they will immediately tell you that you are over-reacting and that they didn’t mean anything they said. However, their purpose is not to tease you – it is to hurt your feelings. You were right for feeling hurt. Your instincts are right, and you shouldn’t ignore them. 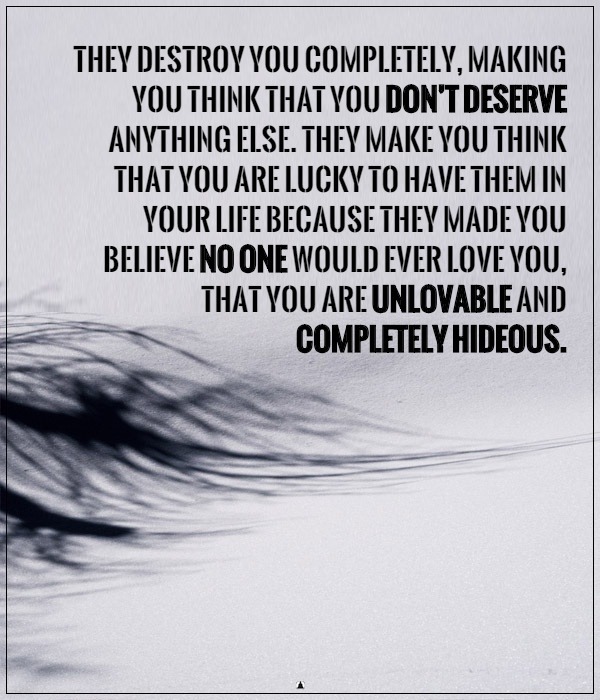 They will try to isolate you from everyone close to you because they are scared that you are going to leave them, and they will be left without their Narcissist Supply – all the love, affection, and attention that you are giving them.